The I-Lab is a secure digital infrastructure to store, share, publish and retain research data. It consists of two storage locations, one regular file storage (the Research Area), an archival storage (the Vault) and a Catalogue. 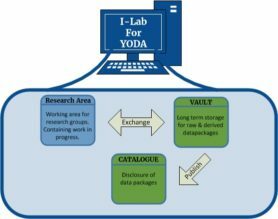 The I-Lab is based on the iRods storage platform which is implemented at the UU under the general name YODA. The I-Lab serves as an extension to YODA. The I-Lab includes the I-Lab Portal, a user interface for generating and/or manually adding metadata, managing users and groups, archiving datapackages in a long term storage and to obtain sustainable identifiers to the archived dataset for reference in a publication. The I-Lab consists of three modules. A Research Area, designed for working with data on a day to day basis. A Vault, designed for long term storage and to function as a repository. A Catalogue, for searching for datapackages in the Vault. Each of the modules is accessible via either the I-Lab portal (web deployed), a browser or your local machine. Next to these three modules is the I-Lab Portal enabling you to perform administrative tasks, like managing users and usergroups, archiving data and adding metadata. For an explanation of some basic concepts like usergroups, datapackage, etc. please read this page.